Image: Daniel Griffin Hunt, Portal, stretch wrap, installation and performance, 2015-ongoing. Courtesy of the artist. Artist Daniel Griffin Hunt will be present to stage his durational performance Portal in the wooded area near the gallery leading up to the opening event, beginning Thursday, January 17. An opening reception for Glimmers of the Radiant Real will be held on Sunday, January 20, between 2 and 4pm at McIntosh Gallery, during which Hunt will stage the conclusion of his performance. Through his performance of Portal, Daniel Griffin Hunt seeks to mediate a conversation between ecological awareness, commerce, and the politics in the middle. 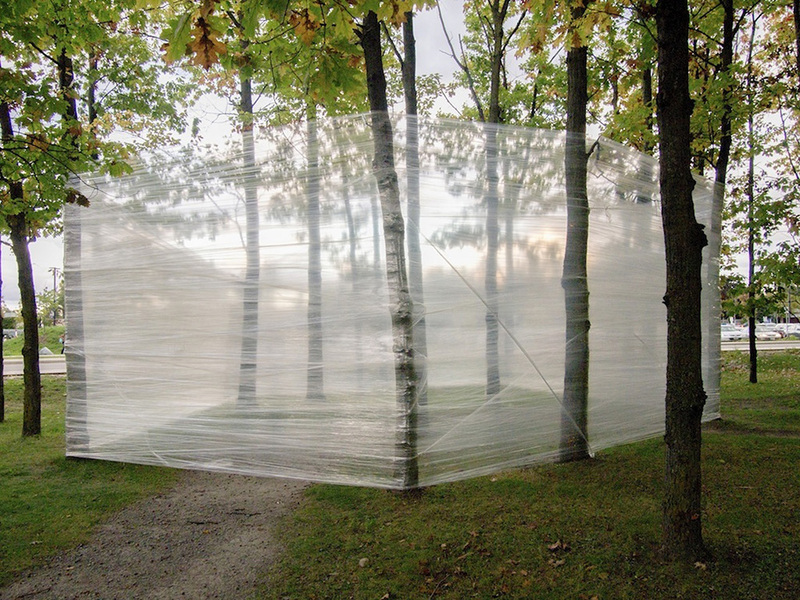 Portal calls attention to the discrepancy between labour, the global circulation of objects, and the conflicting economic and ecological implications of wrapping, shipping and moving cargo with thermo-polymer-plastic film. Image: Jodie Mack, Dusty Stacks of Mom: The Poster Project (film still), 2013, 41min, sound, 16mm. Image courtesy of the artist. Presented in collaboration with McIntosh Gallery, this London Ontario Media Arts Association (LOMAA) screening features a selection of New Hampshire-based artist Jodie Mack’s quirky and colourful hybrid-animations, which engages audiences to partake in her stunningly vibrant visual experiments. The highlight of the programme is a whimsical stop-motion animated rock opera performed by the artist. A shiny otherworld of holographic reverie pairs dollar-store gift bags and haunting resound, unfolding an effervescent melancholy in three parts. Featuring compositions for bowed vibraphone by Elliot Cole. Jodie Mack is an experimental animator who received her MFA in film, video, and new media from The School of the Art Institute of Chicago in 2007. Combining the formal techniques and structures of abstract/absolute animation with those of cinematic genres, her handmade films use collage to explore the relationship between graphic cinema and storytelling, the tension between form and meaning. Her films study domestic and recycled materials to illuminate the elements shared between fine-art abstraction and mass-produced graphic design. The works unleash the kinetic energy of overlooked and wasted objects and question the role of decoration in daily life. Mack's 16mm films have screened at a variety of venues including the Ann Arbor Film Festival, Edinburgh International Film Festival, Images Festival, Projections at the New York Film Festival, and the Viennale. She has presented solo programs at the 25FPS Festival, Anthology Film Archives, BFI London Film Festival, Harvard Film Archive, National Gallery of Art, REDCAT, International Film Festival Rotterdam, Shenzhen Independent Animation Biennale, and Wexner Center for the Arts among others. 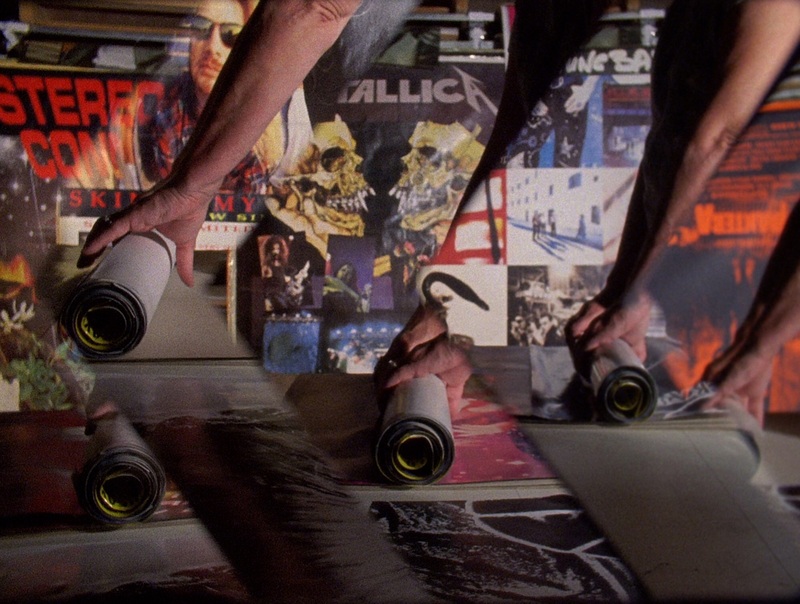 Her work has been featured in publications including Artforum, Cinema Scope, The New York Times, and Senses of Cinema. Named one of Filmmaker Magazine's 2014 "25 New Faces to Watch" and one of the Yerba Buena Center for the Arts' YBCA 100 in 2015, she is an associate professor of animation at Dartmouth College. She is a 2017/18 Film Study Center Fellow and Roberta and David Logie Fellow at the Radcliffe Institute for Advanced Study at Harvard University. LOMAA wishes to thank the London Arts Council's Community Arts Investment Program for their continued financial support. Additional thanks to London Fringe, Canyon Cinema & McIntosh Gallery in co-organizing this event. The screening venue is partially accessible. Dusty Stacks of Mom: The Poster Project + other colourful creations by Jodie Mack is organized by the London Ontario Media Arts Association in partnership with McIntosh Gallery. For more information, contact Abby Vincent, Communications and Outreach Coordinator, McIntosh Gallery, avince5@uwo.ca, 519.661.2111 ext. 87576. McIntosh Gallery returns to the Metro Toronto Convention Centre for this year’s 3/edition Toronto International Art Book Fair, running October 26 – 28, 2018. A selection of McIntosh publications featuring artists Ed Pien, Kelly Wood, Jason McLean, Parker Branch, James Kirkpatrick,Jay Isaac, Luis Jacob, Olia Mischenko, Camal Pirbhai and Camille Turner, and Dan Young and Christian Giroux; and writers Catherine de Zegher, Angela Kingston, Clint Burnham, Max Haiven, Kirsty Robertson, David Liss, Sarah Milroy, Christine Walde, E.C. Woodley, Jen Hutton, Matthew Purvis, Rhiannon Vogl, Anna Hudson, Ben Portis, Brian Lambert, Mike Neiderman, James Patten and Adam Lauder will be available for sale. Up to 50% off the price of select titles. Curated by Adam Lauder, Futurisms sets out to both recover and challenge the avant-garde's potential to engage and transform the social. Luis Jacob, Jay Isaac, Olia Mishchenko, Turner & Pirbhai, and Young & Giroux rewrite familiar histories of the future by offering critical perspectives on the recent and distant past while weaving futural fictions. The exhibition revisited the mixed legacies of historical futurist movements as a framework for situating metamodernist inquiry within Canada’s highly conflicted histories of technonationalism, colonialism, and slavery. The catalogue plots these concerns within a trajectory emanating from the visionary speculations of the London, Ontario-based radical psychiatrist R.M. Bucke. Based on the childhood game of Broken Telephone, artist Faith Patrick will create an experimental text founded on chance, Fluxus poetry, and collaborative error. Over the course of the fair, a participant will write down what they hear whispered from the artist, only to relay that back to the artist, and so on. Involving many fairgoers, this interactive performance involves the enjoyment of play and relies on curious mistakes in translation. The spelling of the title of this interactive performance work is taken from a poem by Maxwell Lucas. Saturday, September 29 from 1-2 p.m.
Thursday, September 20 from 5-8 p.m.
"Next to a River - Embroidery as Map and Shelter"
Friday, September 7 from 5-7 p.m.
McIntosh Gallery is thrilled to partner with +Positive Voice at Nokee Kwe to present their exhibition, We Are Womyn with a Path Leading into the Future. 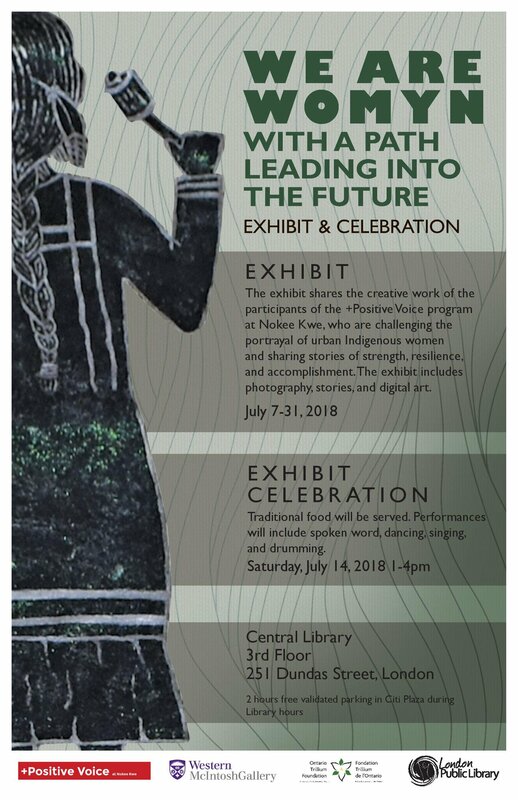 This exhibition features the creative work of the participants of the +Positive Voice program at Nokee Kwe, who are challenging the portrayal of urban Indigenous women and sharing stories of strength, resilience, and accomplishment. The exhibit includes photography, stories, and digital art. A celebration will be held on Saturday, July 14 from 1-4pm, where traditional food will be served, and performances will include spoken word, dancing, singing, and drumming. As part of my investigation on the use of weeds for medicinal purposes I asked Alejandro a traditional mat maker in San Basilio de Palenque (Colombia) to make one using weeds. These plants are commonly used to shield children from wicked witches - the Mohana’s kidnappings, bad eye and other forms of evil spirits. The film registers the making of the mat and the activities going on around its making. 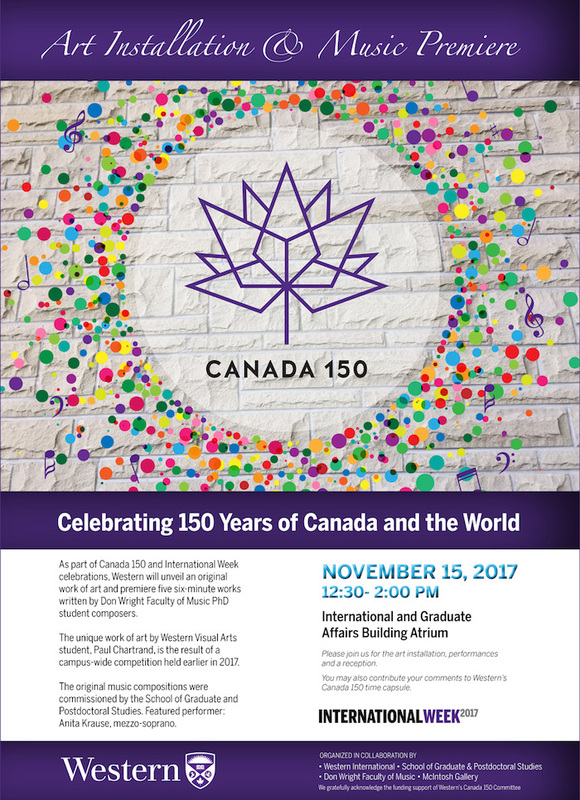 "If You've Got It, Flaunt It"
As part of Canada 150 and International Week celebrations, Western will unveil an original work of art and premiere five six-minute works written by Don Wright Faculty of Music PhD student composers. The unique work of art by Western Visual Arts student, Paul Chartrand, is the result of a campuswide competition held earlier in 2017. The original music compositions were commissioned by the School of Graduate and Postdoctoral Studies. Featured performer: Anita Krause, mezzo-soprano. In addition, there are special highlights on the wartime contributions of Western University including the development of radar, the special chemistry course designed to train the female lab technicians who developed synthetic rubber, and the legacy of two field hospitals staffed by our medical faculty and students. And there are many stories brought to life through rare artefacts: flying ace Eddie McKay, Canadian Army Chaplain Fr. Walter Brown who landed at Normandy, even the address by General Sir Arthur Currie when he dedicated the Middlesex County tower of University College in 1924. Please join us anytime between 1 and 3:30 PM to meet the authors and have your copies signed. for "In the Beginning, 1942" and "Behind the Lines"
and Tunchai Redvers from the "We Matter Campaign"
"Home Front Canada, Looking Back and to the Future"
Sunday, April 2nd at 2 P.M.
Curator led tour of "Shelley Niro: Battlefields of my Ancestors"
"Battlefields: Physical and Political Struggles of the Haudenosaunee"
Battlefields are more than historic places of war and sacrifice. For Haudenosaunee, they denote a larger political struggle to be recognized by non-Native governments as equal partners within their own lands. From the destruction of their homelands during the Clinton and Sullivan Campaign of the American Revolution to the great battles of the First World War, members of the Haudenosaunee Confederacy have put their lives on the line to protect their lands and communities. This struggle, however did not end with the signing of peace treaties, but continues today. Taking their lead from veterans and political leaders, like Chief Deskaheh and Frederick Loft, the Haudenosaunee continue their fight for recognition through protest and political engagement, bringing the battlefield to the home front. Parker Branch, a project by artists Anna Madelska and Jason Hallows, looks at the meaning-producing property of things through an ongoing dialogue between works of art and found objects. Parker Branch: Has things in Common documents and reflects upon over thirty exhibitions organized by Madelska and Hallows in collaboration with other artists and contributors, which were presented in their small storefront space on Stanley Street in London, Ontario, between 2007 and 2014. The book will be launched 6PM on Friday January 13 at YYZ Gallery in Toronto coinciding with their exhibition at the gallery. The book includes a complete chronology of Parker Branch exhibitions and essays by Jen Hutton and E.C. Woodley. This illustrated, 102-page volume was designed by Danielle St. Amour and published by the McIntosh Gallery Curatorial Study Centre (MGCSC) at Western University. Soft cover. First edition, 2014. ISBN: 9780771430848. $20. Joe Roberts will speak at Western University’s McIntosh Gallery as he stops in London on his cross country tour, The Push for Change, to end youth homelessness in Canada. Roberts is pushing a shopping cart across Canada to raise awareness of youth homelessness. His talk coincides with McIntosh’s exhibition, The Vancouver Carts: Photographs by Kelly Wood. The show documents the urban phenomenon of repurposed shopping carts used by people experiencing homelessness. Roberts’s homelessness in Vancouver when he was young is the impetus for Push for Change. As McIntosh director James Patten puts it “The talk and exhibit provide an opportunity to reflect on the critical issue of youth homelessness in Canada. The shopping cart, as a symbol of want in a society of plenty, is particularly meaningful during the holiday season.” The Vancouver Carts: Photographs by Kelly Wood continues at McIntosh until December 10th. For more information, contact Mitra Shreeram, Communications and Outreach Coordinator, at mshreera@uwo.ca or at 519 661 3181. The Fall 2016 Art Now Speakers' Series is organized and curated by Professor Susan Edelstein as a component of ongoing academic offerings in the Department of Visual Arts at Western University. The Series is generously supported by The Faculty of Arts and Humanities. Click here to find out about upcoming Visual Arts events. Steven Lubar is a professor in the departments of American Studies, History, and the History of Art and Architecture at Brown University as well as a current Guggenheim Fellow. His lecture on October 18 is presented by the Public Humanities at Western and will be followed by a reception at McIntosh Gallery immediately after. The following day, McIntosh Gallery will host the panel discussion Public Dialogue 'Engaging Our Communities: Museums, Galleries, and the Humanities' featuring Steven Lubar, Michelle Hamilton, Brian Meehan, and Patrick Mahon. The discussion starts at 5:30PM and will food provided during the intermission. Please see the Facebook page for more details. McIntosh Gallery will be sharing a booth with Brown and Dickson at Edition Toronto, the first annual Toronto international book fair, where we will be launching 3 new publications by Ed Pien, Kelly Wood, and James Kirkpatrick. Present for book signing on Saturday, October 29 will be: Ed Pien at 1PM, James Patten (author of Kelly Wood's book) at 3PM, and James Kirkpatrick at 5PM. Brown and Dickson will also be carrying our entire back catalogue for sale. This event coincides with Art Toronto. Western University Arts & Humanities and the Department of Visual Arts invite you to attend the 2016 BFA/MFA/PhD Open Studios and Graduate Symposium. Last year's Open Studios was a HUGE success, and this year we want to make it even better. To do so we've planned to show a ton of great art by a ton of talented artists in the BFA Practicum, MFA, and Studio PhD programs! This year’s Open Studios (1-8pm) will run in conjunction with the 2016 Visual Arts Graduate Symposium, Upset & Disarray: Re-Presenting the Museum (10am-5pm). Mindful of the stakes at play in the museum’s role as cultural conduit, Upset and Disarrayinvestigates diverse and challenging strategies that promote innovation rather than stagnation, fluidity rather than austerity. This symposium collects timely graduate presentations that address a range of topics, reconfiguring relations between the institutional, the curatorial, and the cultural. Our professional panel is comprised of Lisa Daniels (Curator and Director of the Judith & Norman Alix Art Gallery), Sophie Quick (PhD candidate at Western University, Board Member at Forest City Gallery, founding member of Good Sport), and artist and writer Josh Thorpe (Dan Graham Pavilions: A Guide; A dog at sea; The Unexpected). Our professional panel will be from 2:00-3:45, followed by our keynote at 4:00. Curator and writer Srimoyee Mitra is the keynote speaker for the Art History Graduate Symposium. She is currently the Curator of Contemporary Art, Art Gallery of Windsor. Her most recent exhibition is Wafaa Bilal: 168: 01 on view at the AGW until April 10, 2016 in Windsor, Ontario. She has worked as the Art Writer for publications in India such as Time Out Mumbai and Art India Magazine. From 2008-2011 she was the Programming Co-ordinator of SAVAC (South Asian Visual Arts Centre) in Toronto. In 2015, she edited a multi-authored book, Border Cultures, co-published by the Art Gallery of Windsor and Black Dog Publishing. Kangaroo Variety is a live monthy magazine hosted by Brown & Dickson Booksellers and UnLondon/121 Studios in the old Novack's building (211 King Street). Just like a print magazine, KV offers interviews, features, reviews, investigative reports, satire and editorial pieces. The only difference is, it's completely live! This month features an interview with artist Kim Moodie by James Patten of the McIntosh Gallery; a discussion of racism in the LGBTQ community with Ryan Flex; another great film review by Chris Hachey; food from the Boombox Bakeshop featuring local artists Megan Arnold and Joel Thibert; a live advice column by sexologist Dr. Carlen; and DJ stylings by Harina Mokanan, Queen of the Empyrean. For those who love Hachey's reviews, please know that he will also be viewing movies live in the front window display of 211 King Street from 4 pm on Friday, March 25 until his live review on Saturday night. His viewing will be live streamed, and we will post the link as soon as it is available. Doors Open at 6:30. Event begins at 7:00 pm. Cash bar. Karin Jones is a Vancouver-based artist with a background in jewellery and metalsmithing. While in the Master of Fine Arts program at NSCAD University in Halifax in 2012/2013, she began exploring hair as a craft medium, a marker of race and culture, and an expression of feminine identity. Halfway through her MFA, she was hired as an instructor at Vancouver Community College's Jewellery Art and Design program, where she now teaches part-time, and will return to Halifax to complete her degree in 2017. Her work has been exhibited internationally, most recently at the Royal Ontario Museum, and the National Ornamental Metal Museum in Memphis, Tennessee. Presented in collaboration with the McIntosh Gallery. See Karin's Exhibition on view, January 21st to March 12th, 2016. Johnnene’s husband, David Falls, was McIntosh Gallery’s registrar and installation officer for 27 years before he passed away from cancer in 2009. Essentially an illustrated journal, this book brings together Johnnene’s remarkable works of art and her intimate writing about their seven-year personal journey through what is ultimately a universal story of love, resilience and loss. Join us at McIntosh Gallery for the launch of this special book on Sunday May 1st at 2:00 P.M. Johnnene will be available to sign copies and refreshments will be served. In memory of Dave’s outstanding contributions to the gallery, a memorial oak tree will be planted in the sculpture garden at 3:30 P.M. Everyone is welcome to attend.